The Narconon� program, first established in 1966, provides unique proven methods to help individuals become drug free and remain that way. The key to success of the Narconon program is the Drug Rehabilitation Technology, developed by its author and humanitarian L. Ron Hubbard. This methodology has been used successfully by hundreds of thousands of people around the world to rid themselves of the need for drugs and to regain control of their lives. The Narconon program, unlike more traditional treatment, deals with both the physical and mental problems brought about by drug use. We restore the addict, both mentally and physically, to the person they were before they began using drugs or alcohol. The end result is a success rate that is 3 to 4 times higher than that of other programs. None of these solutions involves the use of any drug. Drugs and their metabolites may quickly become undetectable in blood and urine. Some do so as rapidly as 3 days after the last usage. However, drug metabolites remain stored in fatty tissues for years. The accumulated drug residues continue to cause adverse symptoms. This led L. Ron Hubbard to develop a program aimed at reducing levels of toxins in the body to assist in recovery. 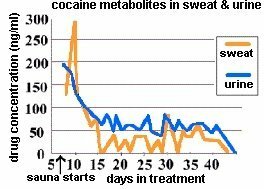 The graph depicts cocaine metabolites being excreted in the sweat and urine of clients participating in the Narconon� "New Life Detoxification Program". Levels of drug metabolites are not detectable in clients prior to the start of this program, then increase dramatically and slowly taper off as the program is continued. This supports the argument that drug residues remain in the fatty tissues, and the correct treatment can mobilize and remove them through the body�s excretory systems. Reduction or elimination of many symptoms associated with drug addiction and alcoholism. William Benitez, founder of the Narconon program, recognized that drug addiction was a type of disability. Utilizing the Hubbard method of detoxification, he began the evolution of what was to become a comprehensive program designed to overcome the disability of addiction by restoring the natural abilities of the addicted person. The Narconon program, which is a combination of; physical detoxification, unique forms of cognitive and objective therapies, and life skills training, is delivered in phases where our �students� complete a series of distinct courses designed to complement and expand on each other. Drug Free Withdrawal assists the individual to cease current drug use rapidly. This is done with minimal discomfort through proper nutrition, use of vitamins, and care from experienced Narconon Staff. The "Therapeutic Training Routine" course extroverts the student and gets him into better communication with others and the environment. The" Narconon� New Life Detoxification Program" is an exact regimen of exercise, sauna, and nutritional supplements that rid the fatty tissues in the body of drug residues and other accumulated toxins. The "Learning Improvement" course gives students the ability to study and retain knowledge by recognizing and overcoming the barriers to studying and learning. The "Communication & Perception" course increases awareness. It also helps the student control and be in better communication with the world. Students help other students do the exercises. By taking the responsibility of helping anothers, the student increases his/her own responsibility, ability to handle life, and the abilty to help others. The "Ups & Downs in Life" course gives the necessary knowledge to achieve greater personal stability and happiness in life. The student learns characteristics of the social personality as well as the antisocial personality. This makes it possible fot them to spot the difference and better choose friends and associates. The Personal Values & Integrity Course gives the knowledge necessary to determine one�s own values and achieve high personal integrity and honesty. It shows how to correct contrasurvival actions by ridding himself of past harmful deeds. The "Changing Conditions in Life" course uses the ethics technology developed by L. Ron Hubbard to apply exact steps that improve conditions in life and repair previous bad conditions. The "Way To Happiness�" course teaches the student a secular moral code as a guide to living a happy life. The Narconon� Program Achieves A 78% Success Rate. The Narconon� rehabilitation program was researched and developed by American author and humanitarian L. Ron Hubbard. The Narconon program, unlike other programs, deals with all aspects of addiction. We restore the addict, both mentally and physically. A graduate of the Narconon program has recovered, and will continue to stay well if he/she uses the tools they learned and practiced while on the Narconon program. The premise of the Narconon model is that a former addict can achieve a new life.